Me with La Signora and Sonia. Our first year in Rome, a few days after our arrival, we wandered into the Campo dei Fiori (loosely translated as, “field of flowers”), an open-air fruit and vegetable market a few blocks from our house that is a wildly popular tourist destination. Knowing nothing about any of the vendors there, we walked up to one of the stalls and began to ask, in our primitive Italian, for various fruits and vegetables we wanted to buy. The stall was the turf of a toothless older woman, a rabid Roma team soccer fan, and her daughter, Sonia, who I suspected was in her 40’s, a proud Communist who wore her party pin prominently. Almost everything they sold, I was sure, came from the central market; none, if any, came from local farmers. I assumed all the stalls were about the same. She had asparagus from Peru, grapes from Chile, and clementines from Spain. Her melons were from the Caribbean Islands. But I was careful and a bit dogmatic about buying only those fruits and vegetables from Italy. After all, Italy is so small compared to the US that tomatoes or citrus fruit from Sicily didn’t seem like purchases from a distant shore. La Signora and Sonia were lovely to us, as they encouraged us to pick what we wanted by handing us plastic bags. They then weighed everything and gave us a price. Little did we know until a couple of years later, that the two tasks, weighing and charging, were unrelated. We were being taken for a few Euros, but we were having fun, and La Signora and Sonia became a part of our daily life. If I went alone to the Campo she inquired about my husband, and vice versa. If one of us were sick, or was skipping school (we went to language school each morning) La Signora would know and sympathize. We couldn’t leave Rome without saying goodbye to her, and as soon as we’d arrive the following winter, we’d go directly to the Campo to say hello. Then I discovered in the Campo a pair of stalls that came only a few days a week. 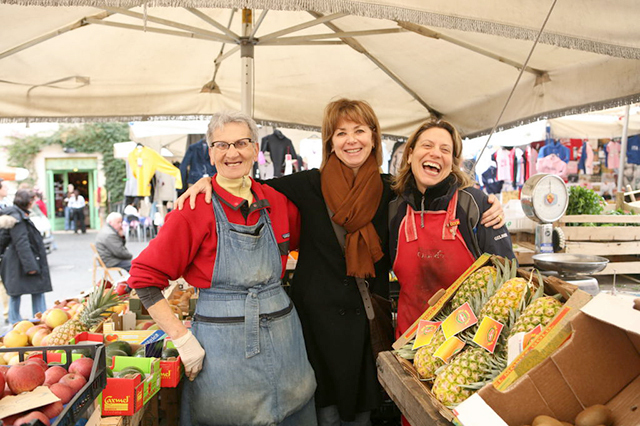 These stalls had fruits and vegetables grown in the gardens of Velletri, where they came from. It was life changing, and money saving. The produce was fresh beyond my understanding of fresh. There were oranges and apples and pears, but none with stickers and code numbers. Their lettuces were tender and tasty. Their spinach alone was worth a trip to Rome. And instead of spending 12 or 18 Euros for produce every day, I’d spend 3 or 4 Euros. For a couple of years I’d sneak into the Campo and go to my “local farmers” and sneak out again, hoping La Signora hadn’t seen me. Eventually, I stopped sneaking and just did my shopping.